We know how to access the inaccessable via our professional UAV/drone operator and, as part of a comprehensive UAV/drone aerial imaging service, we are able to provide unrestricted amounts of high resolution/highly detailed aerial imagery and can also provide a variety of analytical and visual products with informed and actionable information that can be incorporated into your structural inspection reporting methods. Our UAV-mounted imaging sensors can directly access difficult locations resulting in an improvement not only to safety but also to the speed of information gathering and the dissemination of this data to the client. What level of initial structural survey and inspection information detail do you require? Our 15mm (left), 35mm-100mm (centre) and 45mm (right) lenses. With broader aerial imaging options for key infrastructure inspections and surveys that can be captured at set 15mm, 35mm, 45mm, 50mm, 70mm and 100mm focal lengths for specific Imagery Resolution, Ground Sample Distance (GSD) and scaled-for imaging outputs, ARC Aerial Imaging provides a comprehensive service that's beyond the capabilities and abilities of its contemporaries. Our drones and services have been proved capable by providing valuable aerial imaging imaging and data effectively, efficiently and safely! Our Inspire 1 Pro sUAS fitted with the 35-100mm lens for highly-detailed inspection imaging. Through the use of a deployed tripod-mounted field monitor, ARC Aerial Imaging can produce a live feed of your assets and critical asset infrastructure for the benefit to either a member of the facilities management or processing engineering team whilst an inspection is being carried out. So, obtaining survey data (images) is far safer and the enhanced quality of such information means that inspection, repair or maintenance teams can directly pinpoint issues, saving time and money in allocating initial inspection resources (scaffolding, MEWPs, etc). Subjects can be captured with precision and in detail not possible by more conventional means such as a fixed-wing aircraft or helicopter. Its UAV Pilot/Operator and experienced Multi-Sensor Imagery Analyst will know how to reach the areas of importance to your initial inspection requirements. Imaging from the powerful 30x optical zoom Zenmuse Z30 aerial camera onboard our Matrice 210 UAV. Our Matrice 210 UAV fitted with the 30x optical/6x digital zoom Zenmuse Z30 aerial camera for highly-detailed inspection imaging. Inspection imagery analysis and reporting. A first phase (an on-site visual inspection) or a second phase inspection (textual and/or illustrative reports) can be conducted for inspection teams which can be incorporated into their asset management documentation. Inspection teams can additionally benefit from this by including routine task or scheduled external inspections of key infrastructure assets through the use of our previous and archived aerial imaging collection profiles which can be re-uploaded to our drones for accurate imaging collection continuity. 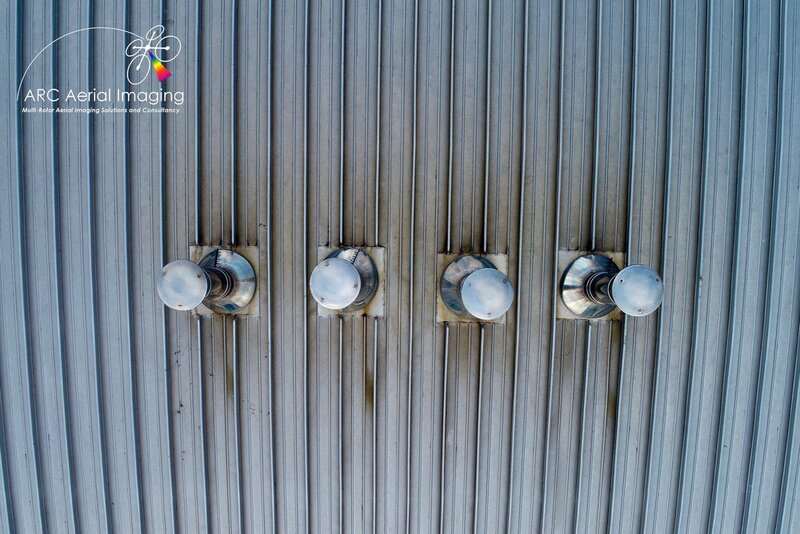 During a recent commission to provide generic aerials of a client's site, one of our drones captured and, identified by our Multi-Sensor Aerial Imagery and Spatial Analyst through a live feed, revealed the significant presence of rust-like discolouration on one of the site's structure's roof exterior cladding. 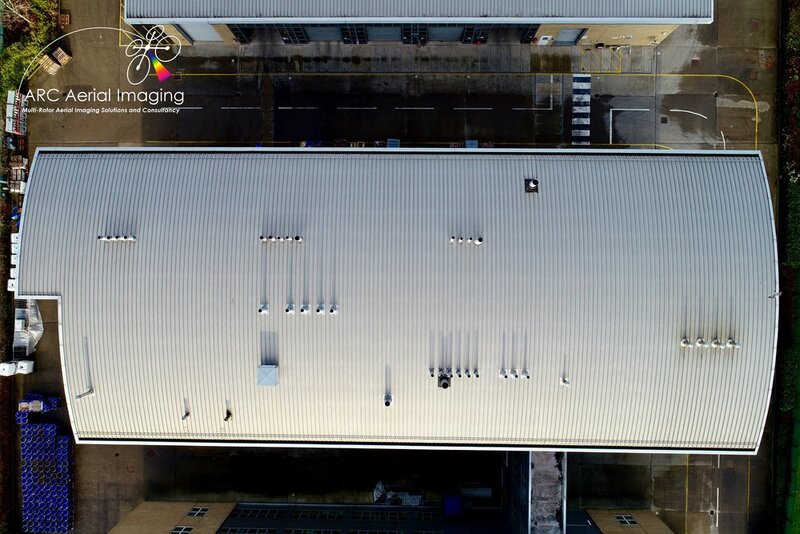 Through initial analysis (1st Phase) of the collected 20MP resolution drone aerial imagery it was calculated that approximately 25-30% of the structure's roof is affected by this discolouration with stronger indications centred at one of the ten venting pipes. Continued first phase analysis revealed that several other venting pipes are also indicating lesser symptoms of this discolouration which are more prominent at their fittings to the structure's roof. Furthermore, possible rust or evidence of corrosion was also observed at several sections along the roof's apex/peak. Back in the office, further imagery analysis (2nd Phase), including analysing historical celestial imaging, suggested that this discolouration had likely started in 2007 and was probably emanated from where the stated heavily discoloured venting pipe is situated. 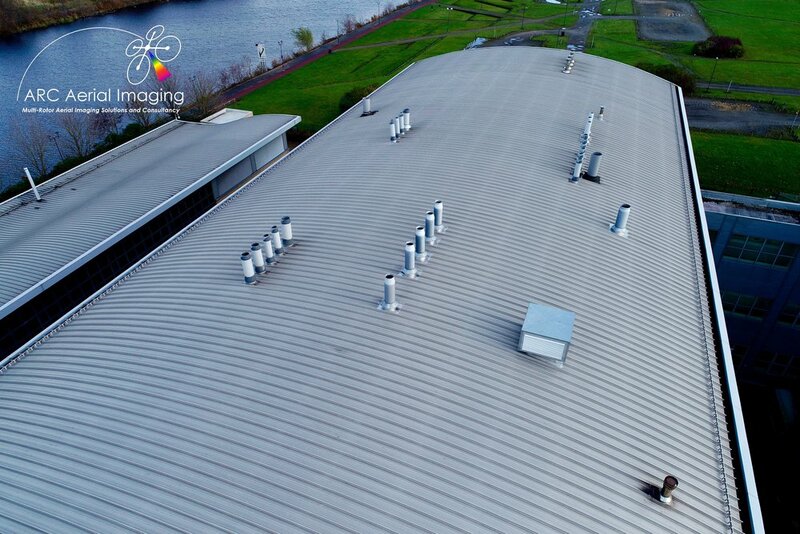 Since 2007 it has gradually spread and has affected up to 30% of the roof's exterior cladding as indicated on imagery. We promptly forwarded this information for their inspection considerations and if further higher resolution, low GSD aerial imaging via our drones would be required of the structure for enhanced remote and forensic analysis. We can also provide aerial visualisation products of infrastructure sites and their surrounds. The creation of 3D models and 360 degree visualisation panoramics (below) taken from specific operating heights can be applied to give stakeholders a visual appreciation on the scale and extent of facilities with products also annotated at specific points for referencing and documentation purposes. Drone Flight Telemetry Data Information. Telemetry data sourced from our drone flight operating logs can also be made available either as additional collateral information (.txt & .csv files) for technical auditing and referencing uses. This can also be promptly overlayed and rendered to inspection videos (below) that will enable structural inspection teams and key project stakeholders to have pertinent positional information when reviewing videos during forensic inspection assessments of subjects and for the inclusions into their reporting methods. One of the most effective uses of UAVs is assisting with regional development teams and construction companies. This can start at the initial phases of development planning by providing initial aerial survey imaging and during the progress of construction by providing aerial imaging updates to management teams/stakeholders right up until the completion of a project. ARC Aerial Imaging's multi-rotor UAV platforms are much more flexible than a fixed mast, cheaper and safer than using a helicopter, even for large construction projects. They can be flown via autonomous waypointing to various viewing and collection points whilst referring from a "live" video downlink feed from an attached monitor or tablet for onsite consultation with the project and construction site managers. The platforms require little space to take off/land and can be prepared quickly before each flight. The cameras onboard the UAVs can be switched from stills to video and back to stills collection modes both on the ground and whilst airborne enabling to capture more and varied content. Many UAV uses in construction fall under the broad header of project support. That includes construction progress reporting, providing images for documentation and monitoring safety. Overall, our UAVs can help with scheduling, communication, and improving accuracy on all types of project functions. Our UAVs fly low level, serpentine flights over projects recording hundreds of images in the process. Later, software can be used to stitch/mosiac together the images creating single, large imagery of a site. 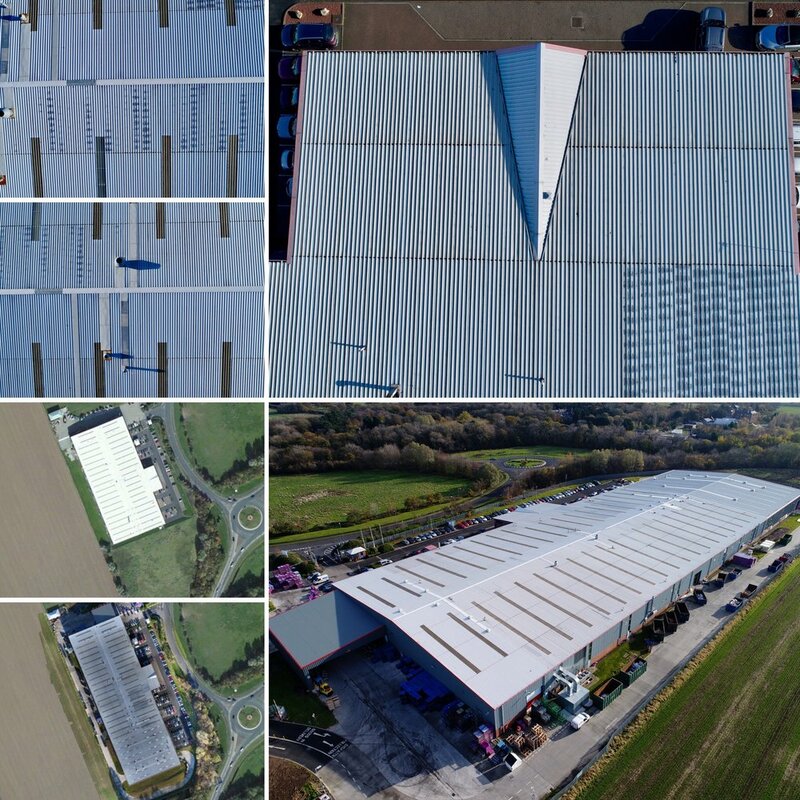 Furthermore, by collecting regular aerial stills and video from the same angles, construction companies can obtain a comprehensive aerial portfolio documenting how their projects are progressing. Upon project completion, this can be presented as further evidence of their work, as illustrated below, to future development projects that are out for tender. We can also undertake low altitude aerial filming and photography utilising our versatile Inspire 1, Inspire 1 Pro, Phantom 3 and Phantom 4 Pro multirotor aircraft with the ability to obtain a variety of shots from 10ft to 400ft in a matter of moments for media and filming companies. We can provide the video in an output format of your choice (FHD and UHD-4K) and to desired applied capture settings (LOG) for onward post production on a medium that benefits you. Whilst we will retain the rights to use any part of the footage for our internal uses, you will retain the rights to the footage for all other purposes. Our dual control aerial system enables one person (the qualified pilot) to have full control of the airframe whilst a second person (the camera operator) controls the camera via a slaved controller to compose and record any complex shots that are required whilst controlling the camera's gimbal. We can give initial familiarity training prior to shoots so that the camera operator can gain confidence in controlling its movements. Through the use of a deployed tripod-mounted field monitor, the filming commission's on site producer/director can view a separate live feed from the drone to gain situational awareness of the aerial shot that is in progress. "We are immensely proud to have assisted Fridge Productions (@fffridge) in providing UAV/drone 4K aerials captured of many stunning locations along the North Yorkshire coastline on a series of tourism films on behalf of the North York Moors National Park Authority with the first of several major marketing films being gradually released over the course of Summer 2016." Based in the North East of England, Fridge Productions are the perfect audio-visual partner to deliver your communication needs and have a reputation for producing award-winning films with broadcast credits on the National Geographic Channel and screenings World-wide. "We are immensely proud to have assisted Fridge Productions once again in providing UAV/drone 4K aerials captured of many stunning locations within the greater North Yorkshire region and its stunning coastline on a series of tourism and business marketing films with several being released over the course of Summer 2017 and Easter 2018." It's being recognised by estate agents in various parts of the country that aerial shots of exclusive properties and which are of substantial size can have a dramatic and immediate impact when it comes to improving their marketing and selling potential, accompanied with traditional methods such as eye-level photographs, brochures and open property viewings. Often in the past estate agents have had limited choices to market these types of properties; either a single aspect shot taken from a fixed mast or from the commissioning of a plane or helicopter. It is much more flexible than a fixed mast (often needing to be relocated to capture the property from different angles), much cheaper and safer than using a plane or helicopter. ARC Aerial Imaging's aerial platforms provide digitial aerial stills and high definition (HD) video and can fly around the property within its grounds whilst reviewing the camera's view from a video downlink to a HD field monitor for the client's visual benefit whilst obtaining multiple shots from different aspects. The platforms require little space to take off/land and can be quickly prepared before flight. Collected images or unedited video segments can be downloaded and stored onto a DVD or client's memory stick whilst on site and be with the estate agent immediately after flight for inclusion into the property's brochure material and/or uploaded on the agency's website that same day. Aerial Imaging for Commercial Property Marketing. We can also provide virtual aerial tour products of real estate marked for initial or continued commercial/residential property development. 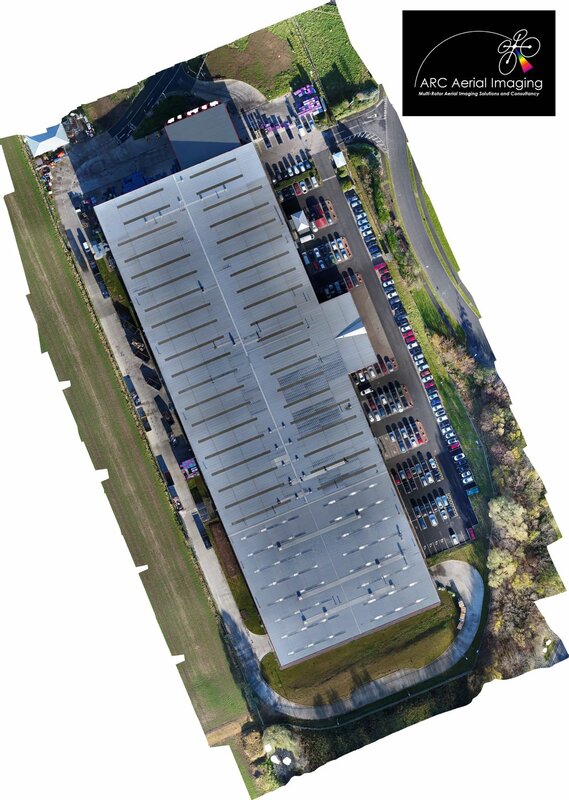 The creation of 360 degree visualisation panoramics (click on image below for an immersive 360 product) taken from specific operating heights can be applied to give planners, property developers and marketing teams a visual appreciation on scale and extent.